According to GoldTasks.com, it is a great site to earn money by completing tasks and surveys. But is it really a legit and real platform to earn on, or is it just a waste of time and a scam? I have joined to test it thoroughly and see what it really offers. 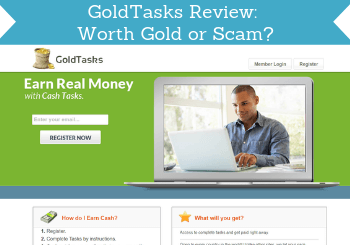 In this GoldTasks review, I will give you all the details so you can see exactly what you get if you join and easily find out if it will be worth your time or not. What is GoldTasks and what does the site offer? But design is not everything when it comes to survey sites. The most important is what it offers you as a member. According to GoldTasks itself, what you will get is access to complete tasks and take surveys. How GoldTasks itself describes what it offers. This is, however, a very generic statement and so many sites say they offer this, so to see if it will be worth it, we need to take a closer look at the options it has inside. So let’s go over what kind of earning methods it offers once you are a member. Paid surveys are one of the earning methods GoldTasks itself mentions on the website before you join. It does, however, not quite work as survey sites usually do. There is no paid survey section on GoldTasks where you can find these. In fact, I could only find surveys in one small part of the offer section. There are paid surveys on GoldTasks.com but they can be difficult to find. So if you join to take surveys on GoldTasks, it might not be clear where you can find them, but as you can see in the image above, there is a place with a few options. There are, however, not very many paid surveys available on GoldTasks, so it will not be a way to earn very much. 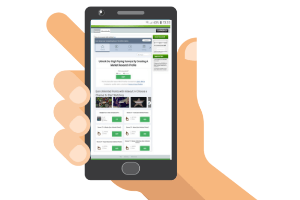 Many survey or GPT (get-paid-to) sites also offer paid offers on offer walls, where you can get paid to, for example, sign up for free trials, download apps, participate in contests, and more. When you look in the menu of GoldTasks, it looks like it gives access to several of these offer walls. At first, it looks like you can find a lot of paid offers – not really the case when you look closer. The problem is just that most of them do not work – at least that has been the case the times I have tried. In fact, there was only one offer wall that worked for me and the rest just took me to a blank page or gave an error message. I know the name of many of these offer walls, as they are used on many other sites as well. You can, for example, find some of them on a site like PrizeRebel. So I know the usually exist and can give some good earning opportunities but they do just not seem to work on GoldTasks.com. The one offer wall I could get to work did have some offers, but this option is not impressive on GoldTasks compared to many other similar sites. Figure Eight tasks are small online micro-tasks you can do and they usually can be a good way to earn some extra cash. There are some good sites that offer Figure Eight tasks, but also here I ran into problems on GoldTasks. When I clicked the tasks option on the menu, I got to a page where I could see it is Figure Eight tasks it offers. But I could not get access to them. The tasks section did not work for me. It might just be a temporary glitch, but it just seems that GoldTasks, in general, do not really keep itself updated and there are too many things that, in my experience, is not really working and not very user-friendly. You can also earn by inviting other people to join GoldTasks. You will get a commission paid by GoldTasks when one of the people you referred earn. As a standard member, you get 20% in commission for tier 1 referrals and 10% for tier 2. Once you have 150 referrals, you move to the next level where you get 25% for tier 1 and 15% for tier 2. The last level you can get to is when you have referred 500 people to GoldTasks. Then you will get 30% of tier 1 and 20% of tier 2. This might sound like a great way to earn, BUT remember that you will only earn when the people you invite earn. And with the limited opportunities on GoldTasks, you should probably not expect huge earnings. Also, make sure you really recommend and like GoldTasks before inviting anyone else to join. Just convincing people to join to get a chance to earn a commission will annoy them and can affect your relationship with them. So even though you can make some money by inviting others to GoldTasks, just be aware that it might not be as easy as it sounds. You earn dollars on GoldTasks no matter in the country you live in. The money can then be paid out in different ways, and you can choose between 3 methods. You can choose between 3 ways of getting paid. You can get paid through PayPal, Alertpay, and WebMoney. I only know PayPal, and really like when sites pay out through PayPal as it is an easy way to get your earnings in cash. So that payout methods is definitely good. The payout threshold on GoldTasks is not very high as you can get your money out already when you have earned $0.50 – in the US, Australia, UK, and Canada the threshold is, however, $1. So nice low payout threshold in all countries. But with the limited opportunities on GoldTasks, it might still take some patience and might not be worth it, in my opinion. I think it is pretty clear by now that in my experience, there is not a lot of earning potential on GoldTasks. Yes, there are a few ways to earn, but it seems most of the options are not working. So you will only get access to very few opportunities compared to the top paying survey sites where many of them offer you daily opportunities. Therefore, you should not expect to be able to earn very much by joining GoldTasks, in my opinion. It is always nice to be able to use survey sites on mobile as you can then easily fit it into your day whenever you have a bit of extra time no matter where you are. In theory, you can use GoldTasks on mobile but the website is not really optimized for mobile. This means the user experience on smaller screens is quite poor and you would have to scroll in and out a lot. But it is possible to use on mobile if you are a bit patient. GoldTasks makes it clear several places on the website that it is open for international users and that you can join no matter where you live. All countries can join GoldTasks. I like when sites are open to all countries, BUT if it does not have much to offer, it does not really matter, does it? Offers and surveys will always vary depending on the country you live in, and with the limited options, GoldTasks offers, it can be challenging to earn no matter where you live. It is always important to know you can get support if you should need it on a survey site. This is something that really concerns me about GoldTasks. There is an FAQ section with some info, but I could not find any contact info for the support and I could not find any way to send them a message. This is a huge deal breaker for me. It should always be possible to get in contact with support and it should be easy to find the info – this is not the case on GoldTasks.com. I am honestly not impressed with what I found after joining GoldTasks. This does not mean you cannot make any money on it, but you need to know what you are getting into. So let’s finish by summing up the pros and cons of GoldTasks so you can get a better overview before deciding if it is for you or not. Overall, it is possible to earn a bit of extra money on GoldTasks but you should, in my opinion, not expect too much. It has very limited options, many things are not working, it is difficult to use on mobile, and there is no info about how to contact their support. Especially the very limited earning opportunities and the lack of contact info are huge deal breakers for me, and it is there NOT a site I recommend. There are so many other great survey sites, so I would instead suggest you to check out the best survey sites in your country here. All these sites have a lot better earning opportunities and will give you better ways to earn some extra money online than GoldTasks. If you have any comments, questions, or if you have any experiences wtíth GoldTasks yourself, I would love to hear from you in a comment below. It is possible to earn a bit of extra money on GoldTasks. It just has too few opportunities, in my opinion. In addition to this, the usability is quite low, a lot of things are not working, and there is no contact info for support. For these reasons, it is NOT a site I recommend as there are many sites with a lot better opportunities.